Tools You Can Use To Sustain A Great Multi-Channel Shopping Experience. The world of retail is large and different websites clamor for a customer’s attention. 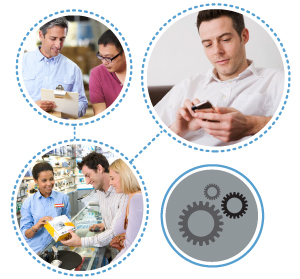 Stores4Stores helps multi-channel merchants get a customer’s attention in two ways. Stores4Stores helps bring the customers to a store through the use of store specific websites, or individual websites for each retail location. Stores4Stores also personalizes the retail experience for customers by promoting the people who work in the store. Just who is included in this process to build and personalize a relationship between a retail location and a customer? At Climb Technology we’ve broken this down into three unique and important groups. Associates are the people who work in a store. Certain associates have specific skills, which should be more widely known in order to demonstrate a retail establishment’s expertise and differentiate them from the competition. The associate’s digital footprint, as in-store-experts within their niche, should extend beyond the walls of the store in which they work. Does an associate have expertise fitting a suit? Finding the best fishing holes? Recommending the perfect appetizer for a customer’s upcoming dinner party? These skills should be evident when a customer visits the local store’s local website. In fact, Stores4Stores can help associates easily add this defining professional information to their store’s home page and profile page through a menu driven system. Stores4Stores makes it easy to for associates to update personal and store-specific webpages, which will appear on their store’s website. Overseeing the entire process is an administrative team who will approve or reject any changes that the associate might make. The Stores4Stores administrative functions ensure that only permitted content is made available to viewers and that consistent brand image is maintained. The store manager can also have administrative capabilities. If a change made by an associate is not approved, the associate will be notified within the system to make edits. When customers visit the retail store’s local website, they start interacting with associates through the Stores4Stores home page. By learning about associates through their the profile that they defined, published, and had approved, the customer can learn when an associate will be in the store, get a question answered, and even receive a quote. There’s no greater personalized draw than for a customer to know who they will be seeing when they visit a store. Of course there are many more features built in to Stores4Stores than these three elements. To see features, visit our Stores4Stores Page Tour blogs #1, #2, and #3. Or, to see how the roles of shoppers, experts, and administrators interact to build a binding customer experience, contact Climb Technology via the web, e-mail, or phone. We’re happy to provide a demonstration of how Stores4Stores will fit into your multi-channel and retail operations.